THE famous and truly Irish family of Maguire, the chiefs of Fermanagh since the year 1302, derive their name and descent from Odhar, the eleventh in descent from Colla-da-chrich, great-grandson of Cormac Mac Art, monarch of Ireland about the middle of the third century. The first of the name who became chief Lord or prince of Fermanagh was Donn Carragh Maguire, who died in the year 1302. Previously to this period, the chiefs of Fermanagh had been elected from the septs of O'Duvdara, O'Hegny, and O'Mulrony, families who have long since either become extinct or sunk into poverty and obscurity. The Sil-Uidhir, or race of Odhar, who, after the establishment of family names took the name of Mag-Uidhir (the c of the Mac being changed to g before a vowel), descends from Odhar, who flourished about the year 1150. 6. Magherastephena and Cuil-na-noirear, now the barony of Coole, the territory of O'Mulrony and O'Cassidy, the latter of whom was chief physician to Maguire. Besides these families who ranked as chieftains, there were many others called termoners and herenachs, who held church-lands, and whose names and lands are described in the Fermanagh Inquisitions and Irish MSS. ; but to enumerate them here, and to point out the very strange names  which these families have chosen for themselves in modern times, would exceed the limits of this paper, in which the history of the chiefs of Fermanagh only is intended to be glanced at. The grand characteristic feature of this territory is Lough Erne, which extends forty miles from south-east to north-west, forming in reality two lakes, both studded with islands, embayed by mountains, and connected by a deep and winding strait, on an island in the centre of which stands the town of Enniskillen. The only river of any consequence is the Erne, which enters the territory a short distance from Belturbet, and flows into Lough Erne at its southern extremity, and escaping from it at its northern end, rolls into the bay of Donegal, tumbling over rocks in two noisy cataracts, one at Belleek, the other at Assaroe, at the town of Ballyshannon. This river and its lakes formed the chief high road through Fermanagh in ancient times; and we are told in an old Irish description of the territory, that when Maguire had collected his tributes in the districts north of Lough Erne, "he embarked in one of the vessels of his fleet, and sailed up to Galloon, where he kept a house of general hospitality for a month, while collecting the tributes of the southern districts." Fermanagh was converted into shire ground in the eleventh year of the reign of Queen Elizabeth, when Cuconnaught, fourteenth in descent from Odhar, was chieftain; and when the Lord Deputy sent to inform him that a sheriff was about to be appointed over his territory, Maguire's answer was: "Your sheriffe shall be welcome to me, but let me know his Ericke, or the price of his head aforehand: that if my people cut it off, I may cut the Ericke upon the countery." Afterwards, in the year 1592, a creature  of the Lord Deputy Fitzwilliam, who had ventured to exercise the office of sheriff in Fermanagh, proceeded, in the usual way, to spoil and oppress the inhabitants with a rapacious train of followers, and Maguire was so provoked, that he rose up in arms, and was actually on the point of cutting off the sheriff with all his attendants, when the earl of Tyrone (who was loyal to the English at this time,) interposed, and prevailed on Maguire to allow them to depart in peace. In 1593, in revenge for this daring act, the Lord Deputy proclaimed Maguire a traitor; but the latter, not discouraged by this proclamation, invaded Connaught in the July of this year, and plundered the adherents of the English government; but Sir Richard Bingham, governor of that province, opposed him, and skirmished with him at the castle of Tulsk, where he slew the Primate Magauran, who had lately arrived from Spain, and happened to be with Maguire on this occasion. Maguire, however, carried off the spoils of this district in triumph to Fermanagh, Bingham not having sufficient forces to prevent him. In the autumn following, the Lord Deputy mustered the forces of Meath, Leinster, and Munster, and the governor of Connaught assembled those of Connaught, then including Thomond, and both parties directed their march to Lough Erne. In this great hosting, the celebrated Hugh, earl of Tyrone, fought on the English side, under the command of Marshal Bagnal, but his own writers state that "it was not pleasing to him to go on this expedition," but that "he obeyed the English through fear." Maguire attempted to intercept their passage across the river Erne, at the ford of Culuain, near Belleek, but in vain, his forces being too few, were cut off with great slaughter. The Earl of Tyrone, who fought bravely against the Irish, was wounded in the thigh on this occasion. Bingham, with the forces of Connaught, and the earl of Thomond with his own men, joined them at the other side of the Erne. The Marshal and the earl of Tyrone then returned homewards, plundering the country as they passed along. They left companies of soldiers in Fermanagh to assist "the English Maguire;" namely, Conor Oge, son of Conor Roe, who was unquestionably the senior of the family, and who was set up in opposition to Hugh, son of Cuconnaught, commonly called "the Irish Maguire." This Conor Oge, who was also called Conor Roe, or Cornelius Rufus, was knighted by Sir John Perrott on the 15th of May, 1585, and in 1608 obtained a general pardon from the king. After the confiscation of Ulster, in the tenth year of the reign of James I., he received a re-grant of 6,480 acres of land in Fermanagh, paying to the king a yearly rent of twenty pounds sterling. Also, a pension of two hundred pounds English during life, and fifty pounds a year to his son and heir, Brian, for life, to commence immediately after the death of the said Connor (Pat. Roll., 10 Jac. I., 27th May). His son, Sir Bernard, alias Brian Maguire, was also knighted, and created baron of Enniskillen, Co. Fermanagh, by Privy Seal, dated at Westminster, 21st January, 1627, and by patent at Dublin, 3rd March, 1627. This Brian, the first baron of Enniskillen, who was certainly the head of the senior branch of the Maguires, married the sister of General Owen O'Neill, and had by her two sons, Connor and Rory. He was living in 1631, when the Leabhar Gabhala, or Book of Conquests, was compiled by the O'Clerys and O'Luinin, Maguire's chief chronicler, under his patronage, in the convent of Lisgool, near Enniskillen. He lived a loyal subject all his life, and died in 1626. But his eldest son Connor, second baron of Enniskillen, his second son, Rory or Roger, and the celebrated Rory O'More, were the prime movers of the insurrection of 1641. It is stated by the cotemporary writers, that this Irish lord, who had retained but a small remnant of the estates of his ancestors, was overwhelmed with debts, and that he longed for a revolution; but as his father had been loyal all his life, no suspicion of disloyalty attached to him or any of his family, who were known in the country as "the English Maguires," until his treason became unmistakeable. At the time of Stafford's execution, an impression was spread abroad that the native Irish meditated some wide scheme of vengeance. The English talked of plots among the Irish, while the Irish feared the designs of the English settlers, and both, when it served their purpose, spread reports of wicked designs, believed to be harboured by the friends of the lately-executed earl of Strafford. It was reported that some dependents of the earl intended to destroy the whole Irish parliament by means of a large quantity of gunpowder, which, it was reported, they had lodged for this purpose under the parliament house. After a careful search in the neighbourhood of the apartments occupied by the Irish parliament, in the castle of Dublin, no gunpowder was discovered, and the committee was inclined to drop the subject. But the Lord Maguire, who was at the head of this committee, "an ambitious nobleman, who exercised considerable influence over the native Irish, and was for reasons recently discovered the object of suspicions," stated that he was not yet satisfied, and showed an extraordinary solicitude to be made acquainted with the situation and circumstances of the government stores; but Sir John Borlase gave him a peremptory denial, observing to him, that "the stores were his majesty's precious jewels, not to be exposed without special cause." At this time, however, no one suspected that Maguire's request had any connexion with a conspiracy to seize the stores; but the events which followed in a few months showed clearly the object which this Irish nobleman had in view. He was the very first of the Ulster chiefs who joined Rory O'More in the great conspiracy of 1641; but when their plot of seizing on Dublin castle was betrayed by Owen O'Connolly, he was taken prisoner and sent to the Tower of London, so that he does not figure in the stirring scenes of this great rising; but his brother, Rory Maguire, took the leadership of the great sept of Fermanagh, and acted a very conspicuous part in the military operations of the Irish. He was slain in battle at Carrick-on-Shannon in 1613, leaving by his wife, who was of the Hassett family, a son, Roger, who was called baron of Enniskillen, in 1688. Conor, baron of Enniskillen, wrote, with his own hand, while confined in the Tower of London, a relation or confession of the intended plot of seizing the castle of Dublin and of recovering their ancient estates, which relation the curious reader may see in Warner's "History of the Irish Rebellion," Appendix, p. 9. He also wrote, with his own hand, the day before his execution at Whitehall, his last Will and Testament, which the writer of this paper perused at Enniskillen in the year 1834. It was then in the possession of Mr. Thomas Maguire, a hardware merchant in Enniskillen, who refused to allow him to copy it, from an idea that it would lessen the value of it. This Thomas was locally styled the baron, and was believed to deduce his descent from Rory, the brother of the baron of Enniskillen. Conor, the second baron, had a son Conor, third baron, who had a son who succeeded as fourth baron, but died without issue, when Roger, the son of Roger, the brother of the second baron, succeeded as titular Baron of Enniskillen. In the reign of James II., this fifth baron, who was the head of the "English Maguires," was made lord lieutenant of the county of Fermanagh by King James II., and had for his deputy-lieutenant Cuconnaught, or Constantine Maguire, of Tempo, Esq., head of the "Irish Maguires," and who was high sheriff of Fermanagh in 1686. At the Revolution, as we are informed by De Burgo, in his Hibernia Dominicana, p. 332, note, H, the fifth baron of Enniskillen was a captain in the infantry regiment of Alexander Mac Donnell, third earl of Antrim. Both he and Maguire of Tempo levied each a regiment for King James, and both were at the battle of Aughrim. After the treaty of Limerick, the fifth baron of Enniskillen accompanied the Irish army to France, and having no regiment there, resided at St. Germain-en-Laye, where he died, without issue, in October, 1708, aged 67 years, so that he was born in the eventful year of 1641. He was succeeded by his brother Philip, as sixth baron of Enniskillen, who married the daughter of Sir Phelim O'Neill, and sister of Colonel Gordon O'Neill, and had by her a son Theophilus, seventh baron of Enniskillen. He married Margaret O'Donnell, by whom he had Alexander, who was eighth baron of Enniskillen, and was an officer in the Irish brigades about the middle of the last century —a captain in the regiment of Bulkeley. The last baron of Enniskillen of the name of Maguire in the French service, was pensioned as a retired captain  of the regiment of Lally, at the commencement of the French Revolution in 1789. It is highly probable that this, which was certainly the senior branch of the illustrious family of Fermanagh, is now extinct, not only in France, but also in Ireland; but if any of our readers will point out to us that members of it still exist, he will gratify us exceedingly. For the line of descent of both families, as well as for that of Mac Manus of Senat, the reader is referred to the Annals of the Four Masters, A.D. 1498, page 1242. We shall now return to the history and pedigree of the "Irish Maguire." In 1594 the lord deputy marched with a great force to Enniskillen, and laid siege to the castle, which he partly destroyed by military engines, and finally took. He left a garrison of his own soldiers in it, and then returned to Dublin. When Maguire heard of his return, he despatched messengers to Red Hugh O'Donnell to request his aid, and O'Donnell promptly responded to his request. They laid siege to the castle from the beginning of June to the middle of August, during which time they plundered and laid waste the lands of the English Maguire and of all those who adhered to the English cause, not only in Fermanagh, but also in Oriel and Brefney-O'Reilly. O'Donnell, however, hearing of the arrival of Donnell Gorm Mac Donnell and Mac Leod of Aca, at Derry, repaired thither with a small band of his forces to hire them in his service, leaving the rest of his forces to assist Maguire at the blockade of Enniskillen. The garrison of Enniskillen found means to send word to the lord deputy that they were reduced to great extremities from the want of provisions, and his lordship sent orders to the men of Meath, as well as to the O'Reillys and the Binghams of Connaught, to convey provisions to Enniskillen with all possible speed. These people proceeded to Cavan, Sir John O'Reilly's chief town, where they obtained the provisions, and then set out by forced marches for Enniskillen, keeping Lough Erne on the right. Maguire having intelligence of their route and intentions, set out with his own forces and those left him by O'Donnell, being joined also by Cormac, the brother of the earl of Tyrone, (the earl himself still clinging to the English, but wavering,) and they halted at a ford on the river Arney, now spanned by Drumane bridge, about five miles south of Enniskillen, where they knew the enemy should pass. Here both parties met face to face, and a fierce and vehement battle was fought between them, in which, at length, Maguire and his forces defeated the enemy by dint of bravery. A great slaughter was made; many steeds, weapons, and other spoils were left behind by the enemy, besides all the horses that were loaded with provisions intended for the victualling of the fortress of Enniskillen. A few of the gentlemen of Meath and of the O'Reillys escaped from the conflict, and fled precipitately from Fermanagh and George Oge Bingham, with the survivors of his party, retreated with all possible speed through Magauran's country and Brefney-O'Rourke, never halting till he arrived at Sligo. The name of the ford at which this battle was fought was changed by Maguire to that of the Biscuit ford, on account of the great quantity of biscuits and small cakes left behind there by the fugitives on that day. When the garrison of Enniskillen had heard of the defeat of the forces sent to their relief, they surrendered the fortress to Maguire, and he gave them pardon and protection. Philip O'Sullivan Beare, who evidently had the account of this battle from persons who fought on both sides, gives the only account of it worth reading. As Cox, Leland, Moore, and most other historians have passed it over unnoticed, or barely mentioned it as a mere skirmish, we shall here lay before the reader a close translation of the account of it, given by P. O'Sullivan, who describes the Irish battles of the reign of Elizabeth far better than any other Irish writer, for this reason, because he had received the account of them from military men who were present at most of them, and, because, being a military man himself, he knew how a battle should be fought, and how to describe it scientifically. “In this state of affairs, the garrison of Enniskillen, besieged by O'Donnell, was suffering from want of provisions, but a certain son of the hungry fortress, a betrayer, who had been left in it by the English, a voracious hog, afflicted with hunger, was sent in a boat with five of his fellow-soldiers, because he was acquainted with the territories and the roads, to announce to what distress the fortress was reduced, but he was intercepted by the Catholics and cut off, together with his companions. The English, nevertheless, not being ignorant of the distress of the fortress, hasten to obtain provisions. Salt meats, cheese, and a great supply of biscuits were procured. The garrisons were called out. A selection of Irish soldiers was made. From all the Irish lately levied and the English garrisons, two thousand five hundred men were collected, among whom were five hundred horse. Over these Henry Duke, an English knight, president of Offaley, is placed as commander, and the Marshal Foal, also an Englishman, of whose designs, as soon as O'Donnell was made acquainted, he sent messengers to Tyrone to apprise him that the Protestants were sending relief to Enniskillen; that he was resolved to resist to the death; that it was evident in what danger affairs stood; and that, therefore, he would regard Tyrone as an enemy unless he should bring him assistance at this extremity. On hearing this message, the anxious Tyrone was distracted with various cares, revolving in his mind that O'Donnell was waging war with the hope of Spanish aid, before he saw the Spanish banners displayed in Ireland, and that, therefore, the Catholic cause was placed in the greatest jeopardy, even if he himself should [on this occasion] lend his [utmost] aid, but that he could be of little assistance to the Catholics; that he was suspected by the Protestants, and that, therefore, he would be set down as an enemy to both. However, on the approach of the queen's army, Cormac O'Neill, Tyrone's brother, came to O'Donnell's camp with one hundred horse and three hundred musketeers, but whether he was sent by Tyrone, or came of his own accord, it was by no means evident. Maguire and Cormac O'Neill went forth against them from O'Donnell's camp with one thousand foot, that they might prevent them from making incursions, and deprive them of sleep and rest, that they might be able to fight the less strenuously with O'Donnell afterwards. In the meantime, Duke halted not farther than three hundred paces from a ford on the Farney river, where, after nightfall, he was suddenly overwhelmed by Maguire and Cormac with a dense shower of leaden bullets discharged from muskets, against which Duke also sent his musketeers. Thus, both parties fighting at a distance, the queen's people are deprived of sleep by the danger and the report of the muskets. On the morrow after the break of day, Duke, drawing out three lines, supported by flank companies of cavalry and musketeers, because he had a great baggage, consisting of garrons, which carried the provisions, of asses, camp servants, and harlots; these he divided into two parts, placing the one between the first and second line, and the other between this and the last. Having drawn out his soldiers in this manner, he advanced from the camp, his soldiers overwhelmed with sleep from the last night's wakefulness, he was frequently compelled to stop short by the Catholics continually hurling darts at them; and to remove them in turns at a distance. At the eleventh hour of the day, he came within musket-shot of the ford of the Farney, where he ordered the horse to dismount, because the place was not fit for a cavalry engagement. Here Maguire and Cormac, with one thousand foot, contend with all their might. Their musketeers, first fight bravely with the first line, and, ultimately, not only their musketeers, but also their pikemen press on. But the first division opening a way with the sword, and driving the Catholics on both sides, enter the ford. In the meantime, the Catholic musketeers who fought with the last division, drive the wings of the Protestant musketeers into that division, and by a continual discharge of leaden balls, caused a trepidation among them, and their ranks being now disturbed, the Catholic pikemen rushing forward, completely threw them into disorder, and they commingled the first division of the baggage with the second division of the lines: they afterwards drive them into the central division. Here the middle division underwent a double struggle, the one by arranging the last division, and the other by resisting the Catholics; but the Catholics, by pressing on, threw both into confusion, and driving them through the other part of the baggage, confound them with the first division. So the whole army being thrown into disorder, entered the ford with confused tumult, leaving behind the provisions and all the baggage, having saved their horses only, which were of great moment to the horsemen. Duke held a consultation to see what was next to be done. He decided that George Bingham, junior, should return home, lest all should perish of hunger, and meet the same fate as the defenders of Enniskillen, whom they were not able to relieve. On the other hand, Marshal Foal (which name signifies stultus) foolishly exclaims and protests that they should relieve the royal fort. The place where this Protestant had stood, was encumbered with moisture, where the horses being stuck in the mud, could be of no use. He was, therefore, wounded by the Catholics with the greater impunity. For this reason, Foal led forth the wing of the musketeers against the Catholics that he might remove them, whilst the army should be again drawn into array. But sooner than begun he desisted, being pierced and slain with a lance. By which the whole army of the Protestants being thrown into consternation, having deserted even their horses, they returned to the ford which they had lately crossed, without any order or command. From which they were driven by the Catholic musketeers, who partly seized on the baggage and partly blocked up the ford. Now, being doubtful as to what counsel he should best adopt, he betakes himself in quick course to another ford, which he observed a bow-shot higher on the river, and precipitates himself into it before it could be occupied by the Catholics. But the ford, which was deep, was entered with such celerity and trepidation, about one hundred soldiers were drowned, over whose bodies the others crossed it. Maguire longed for an opportunity to wreak his vengeance on Sir John O'Reilly and his adherents for the service which he intended to render the English; and he soon found himself in a condition to insult and weaken them. In 1595 he was joined by his neighbour. Mac Mahon, chief of Oriel, and they entered Brefney-O'Reilly with their united forces. They plundered and ravaged the whole territory, and the Four Masters inform us, that they left not a cabin in which two or three might be sheltered in the whole of the town of Cavan which they did not burn, nor any other building, except the monastery, in which there was an English garrison at the time. In 1597, Maguire and his friend Cormac, the brother of Hugh, earl of Tyrone, pillaged Mullingar, and devastated the country around it. They carried away from Mullingar, on this occasion, all its gold, silver, copper, iron armour, and foreign wares, and everything else that could be carried or driven, and then set fire to it. In the year 1600 Maguire accompanied the earl of Tyrone, who was then in open rebellion, on his famous expedition into Munster. They encamped at Inishcarra, between the rivers Lee and Bandon, in the month of March. One day Maguire went forth to scour the districts in the vicinity of the camp, and his people seized great preys, with which they encamped for the night at some distance from O'Neill's camp, but Maguire did not remain with his people, but set out to inform O'Neill of the great spoils which he had acquired. It happened, however, that Sir Warham St. Leger had his spies set to watch him all the day, and when he heard that he was returning to O'Neill's camp almost alone, he assembled a body of well-armed, mail-clad horsemen, and proceeded to a narrow defile by which he was sure Maguire should pass on his way back to O'Neill's camp. He was not long in this ambush, when he saw Maguire coming on with a small party of cavalry. Maguire and Sir Warham engaged in single combat; and the Four Masters inform us, that Maguire slew him and five of his horsemen, and made his way through the rest by dint of valour, but being severely wounded, he fell dead from his horse before he could reach O'Neill. The loss of Maguire depressed the spirits of O'Neill, who resolved to return home to Ulster without delay. Sir John Davies observes, that this "Hugh Maguire, who was slain in Munster, was indeed a valiant rebel, and the stoutest that ever was of his name." “Here Maguire, accompanied by Edward Mac Caffry, his standard-bearer, Niall O'Durnin, and one priest, going forth from the camp, fell in with Warham St. Leger, an English knight, president of Munster, accompanied by sixty horse. Between these two warriors there was a great private emulation, besides the enmity which existed for public causes, because the Irish yielded the palm to Maguire for bravery and dexterity at arms, and the English to Sir Warham. Maguire, on seeing the multitude of the enemy's horse, did not think that it was consistent with his dignity either to fly or to surrender himself. But, setting spurs to his horse, he rushed into the midst of his enemies. As he brandished his spear, Sir Warham shot him with a leaden bullet from a pistol. Nevertheless, Maguire sought Sir Warham with his spear, whom, as he inclined his head to avoid his stroke, he pierced through the helmet, and leaving the spear hanging from his head, he drew his sword and cut his way through the middle of his enemies, his two horsemen, also wounded, and the priest following him; and turning his horse round again, he rushed upon and put them all to flight; nor did he follow them far; before he could reach O'Neill at the camp, alighting from his horse, he, being expiated by the priest, breathed out his soul through his wound. His horse is said to have abstained from food until it died. Sir Warham, too, was reduced to madness by the effects of his wound, died in fifteen days afterwards.”—Hist. Cathol., tom 3, lib. 5, c. xii. His brother, Cuconnaught Oge, who was the son of Margaret, daughter of the celebrated Shane O'Neill, prince of Tyrone, was elected his successor. Of this Cuconnanght we hear nothing until the year 1607, when he and a few of his friends sailed in a French ship into Lough Swilly, and cast anchor opposite Rathmullan, where he awaited the arrival of the earls of Tyrone and Tirconnell and their followers. They entered the ship on the festival of the Holy Cross in autumn, and sailed into France. The cause of this precipitate flight of Maguire and the earls has ever since remained enveloped in mystery. In the account of the flight of O'Neill, the earl of Tyrone, preserved in Irish in the college of St. Isidore at Rome, it is mentioned that O'Neill had received a letter from John Bath, informing him of the arrival of this French ship; but it seems to throw no light on the immediate cause of their flight. P. O'Sullivan Beare states that O'Neill was informed by certain English friends of his, that the English government intended to seize him, and that, therefore, he fled into France, where Henry IV., king of France, refused to deliver him up to king James's ambassadors. These fugitives complained on the Continent of their having been persecuted for religion, and it was deemed expedient by the king and the state that this should be publicly denied. A proclamation was accordingly issued by the king, wherein he affirms that "they had not the least shadow of molestation, and that there was not any purpose of proceeding against them in matters of religion; their condition being to think murder no fault, marriage of no use, nor any man valiant that does not glory in rapine and oppression; and, therefore, 'twere unreasonable to trouble them for religion, because it could be perceived by their conversation that they had not any." We have proof positive, however, that after the submission of O'Neill and O'Donnell, and "in the midst of the most universal peace that ever was in Ireland," the king's counsellors published in Dublin the "Act of Uniformity" of the 2nd Elizabeth, which strictly "prohibited the attendance upon the Roman Catholic worship, and a proclamation was issued on the 4th of July, 1605, wherein his majesty declared to his beloved subjects in Ireland that he would not admit any such liberty of conscience as they were made to expect, and commanded all the Roman Catholic clergy, by a certain day, to depart the realm." If this did not indicate a purpose to proceed against the earls in matters of religion, the language of princes is beyond the comprehension of subjects. Maguire did not long survive the loss of his principality. He died of a burning fever at Genoa on the 12th of August, 1608. This Cuconnaught Oge left a son, Brian Maguire, who was a minor at the death of his father. In the 8th year of James I., he was restored to some tracts of land in Fermanagh, the principal division of which was called Tempo, the whole estimated to contain two thousand acres—total rent £21 6s. 8d. English. This Brian had one son, Hugh Maguire, who married the daughter of O'Reilly, by whom he had CUCONNAUGHT MORE, who married the daughter of Ever Magennis, of Castlewellan, in the county of Down, and had three sons, Brian, Hugh, and Stephen, the two latter of whom died without issue. He mortgaged a great part of his estate to raise, arm, and support a regiment of horse for the service of James II., of which he was colonel. He was sheriff of Fermanagh in 1687. According to the tradition in the family, which seems to be correct, he fought desperately at the pass of Aughrim, where he himself was killed, and Alexander Maguire, his lieutenant-colonel, taken prisoner, and his regiment cut to pieces, after having nearly annihilated the second regiment of the British horse. Tradition adds that he was struck down by a grape shot, and left dead on the field; but one of his followers, named O'Durnin, cut off his head with his sword, and carried it in a bag to the island of Devinish, where he buried it in the family tomb of the Maguires. At the court of claims, Mary Maguire, widow of Colonel Cuconnaught Maguire, was allowed a jointure off Tempo and other lands in Fermanagh, as was Brian, his eldest son, a remainder in tail therein. This Brian Maguire married the daughter and heiress of James Nugent, Esq., of Coolamber, by which marriage he was able to pay off certain debts with which the estate of Tempo was encumbered. He had five sons and one daughter: the two eldest of the sons died unmarried. He died himself in 1700, and was succeeded by his third son, Robert Maguire, who is mentioned by the venerable Charles O'Conor, of Belanagare, in his Dissertations on the History of Ireland, printed in 1753, as the then head of the Maguires of Fermanagh. This Robert married the daughter and heiress of Henry Mac Dermot Roe, of Greyfield, Esq., in the county of Roscommon, but died without issue, and was succeeded by his next brother, Hugh Maguire, the fourth son of Brian of Tempo. This Hugh was a colonel in the Austrian service, and married the honourable dowager lady Cathcart, of Irwin water, Herefordshire, and dying in Dublin, without issue in 1763, was succeeded by his youngest brother, PHILIP MAGUIRE, the fifth son of Brian. He married Miss Frances Morris, daughter of Nicholas Morris, Esq., of Latteragh, in the county Tipperary, by Miss Susanna Talbot, of Malahide. This Philip had several daughters who were most respectably married, and one son, HUGH MAGUIRE, of Tempo, Esq., one of the most puissant, high-minded, and accomplished gentlemen that ever came of the Sil-Uidhir. The writer was acquainted with many old persons in Fermanagh and Dublin who knew him intimately, and were entertained at his hospitable and sumptuous table at Tempo. He mortgaged Tempo to the Emerson Tennant family, and left his family in great distress. He married Phoebe Mac Namara, daughter of George Mac Namara, Esq., of Cong, county Mayo, and died in October, 1800, leaving three sons; 1. Constantine, a gentleman of polished manners and indomitable courage, who was murdered in the county of Tipperary in 1834, at the very time that the writer was at Tempo. He left one son, whose legitimacy was denied by his brother Brian, but who now enjoys a small estate to which Constantine succeeded in light of his mother; and some daughters. 2. The second son of Hugh was Brian, and the third, Stephen, who enlisted as a private soldier, and died soon after broken-hearted, and several daughters. BRIAN MAGUIRE, the second son of Hugh of Tempo, was an officer in the East India Company's native army in Bombay, which he joined in 1799. In the year 1811, a short memoir of this remarkable man, evidently his own production, was printed in Dublin by W. Cox, 150, Abbey-street, giving an account of his several duels with English officers, and of several circumstances that occurred to him in India and Europe, to which is annexed a genealogy of his family, which shewed him to have been related to some of the best families in Ireland, being the second cousin of the then earl of Ormonde, and of lord Talbot of Malahide. This little work was suppressed at the request of Mr. Maguire's friends, and very few copies of it are extant. He married, in 1808, Miss Honoria Anne Baker, daughter of James Baker, Esq., of Ballymoreen, in the county Tipperary, and had by her several sons, some of whom were reduced to the condition of common sailors on the coal vessels sailing between Dublin and the coasts of Wales. Thus, in one generation, has the proudest blood of Ireland sunk to one of the vulgarest states of human existence, and commingled with that of a class amongst whom, more than a century ago (according to Dean Swift), the true representatives of the ancient Irish nobility were to be found. From Hugh Maguire, son of Philip, and brother of Thomas More Maguire, prince of Fermanagh, who died in 1430, descended Hugh Maguire, who served as captain in the regiment of Cuconnaught More Maguire, who was slain at Aughrim. From this captain Hugh Maguire descended, in the fourth generation, Mr. Richard Maguire, of Dublin, banker, whose will is dated 27th January, 1727, and proved 30th December in the same year. He married Elizabeth, daughter of Alexander de Bowdel Dutozail, who died March, 1752, and had by her William Maguire, of Dublin, who died in April, 1763, who married Elizabeth, daughter of Francis Annesley, and had by her: 1. William Maguire, of George's-street, Hanover-square; 2. Arthur Maguire, solicitor, who married Anne, daughter of Walter Croker, Esq., of Lisnabriny, in the county of Cork, and had by her the Rev. Arthur Maguire, rector of St. Thomas's parish, Dublin, and several other sons, whose issue are probably still extant. William Maguire, the eldest son of William, the Dublin banker, had by Lucy, widow of ——— Fytche, governor of Bengal, a son, William Maguire, Esq., of Rostrevor, in the county of Down, who died in February, 1822. He married Anne Elizabeth, daughter of John Moore, Esq., of Clough, in the county Down, and had by her William John Maguire, who married Lady Mary Annesley, daughter of Richard Lord Annesley, but of their descendants we know nothing. It appears from the patent rolls of the reign of James I., that several junior branches of the Maguires of Fermanagh were restored to small estates by that monarch, but they all forfeited these estates either in Cromwell's time or at the Revolution. There were several officers of the name of Maguire in the Irish brigades in France, belonging to the regiments of Lee, Dorrington, Dillon, O'Donnell, Fitz-James, Bulkeley, and Lally, The principal of these was Philip Francis Maguire, who was born at St. Omer in January, 1740, served in the regiments of Bulkeley and Dillon, in the latter of which he was captain from 1779 to 1783: and he was a chevalier of the royal and military order of St. Louis. But by far the most distinguished of the Maguires on the Continent was John Sigismund Maguire, descended of the Maguires of Lurg, who fled from Fermanagh in Cromwell's time, and sought refuge in the county of Kerry. He was colonel of a regiment of infantry of four battalions, a general of artillery, a lieutenant-general, governor of Carinthia, an imperial chamberlain, and a grand-cross knight of the military order of Maria Theresa, and of the white eagle of the king of Poland. As opposed to the Prussians in the Seven Years' War, he is often mentioned by Frederic the Great, against whom he successfully defended Dresden in 1760. General Maguire, who united the attractions of a polite and liberal education with comeliness of person, was married to a Moravian lady of noble family, "it being well known," says a cotemporary account, "that no lady of distinction in Germany will marry a foreigner, unless he maketh it appear that his ancestors have been gentlemen, and their wives equally born, for sixteen generations." The family of Maguire is still very numerous in Ireland; and though it has lost the large estates to which the two great branches, called the "English and Irish Maguires," were restored at the plantation of Ulster, there are still remaining some branches of the same race highly respectable in other parts of Ireland, as Maguire of Clonea castle, near Dungarvan, in the county of Waterford, and John Francis Maguire, Esq., M.P. for Cork, who inherits the talents, spirit, and highmindedness of his ancestors in an eminent degree. The writer has to add, that he has been informed that a Maguire has lately returned from Spain who has purchased a considerable tract of property in Fermanagh, including one of the islands in Lough Erne. The usual armorial bearings of the Maguires are: on a chief, a dexter hand argent; in base, a salmon naiant. Another branch of them bore: a man in armour, mounted on a steed, bridled and caparisoned, both or. 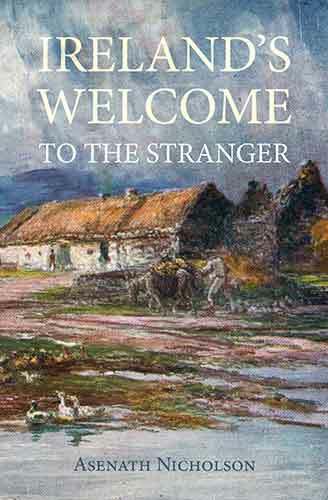 Odd names.—Almost all the farmer families of Fermanagh have two names—a country name and a town name—thus, Mac Scullog in the country is called Farmer in the town; O'Luinin is called Linnegar; Mac Gillafinnen becomes Leonard; O'Muldoon becomes Meldon; Magunshinan becomes Gilson; O'Drum becomes Drummond; Mac Gillacuskley becomes Cosgrove, and sometimes Costello; O'Howen becomes Owens; Mac Gailghile becomes Lilly. However, the O'Flanagans of Tooraa, the Mac Donnells of Clankelly, the O'Meehans and O'Caseys of Devenish, the Magraths of Termon-Magrath, the O'Cassidys of Coole, the O'Corragans of Magherameelagh, and the O'Quigleys of Cloontivrin, have preserved their ancient names unaltered, with this exception, that they have all rejected the O. It is a very strange fact, that the prefix O has been dropped in every instance and the Mac retained. This national antipathy to, or fear of the O is a phenomenon which has not yet been satisfactorily accounted for. Davies's True Discovery, &c., p. 665, of Thom's edition. Leland, book iv., ch. 4. O'Callahan's Irish Brigades, vol I., p. 279. Dr. Leland, who had O'Sullivan's account of the siege of Enniskillen before him, as well as the testimony of the Four Masters, thus describes the surrender of the castle of Enniskillen, to his eternal disgrace as a historian:—"The deputy was now to prosecute the insurgents of the north, and particularly to relieve the castle of Enniskillen: for this purpose, leaving the earl of Ormonde to command in Leinster, which was now harassed by the turbulence of the Irish septs, he led his forces towards Fermanagh; but soon learned that his expedition was too late. The English troops detached against the besiegers had received a total defeat from O'Donnell and his confederates; and the garrison, reduced to desperation, had surrendered, and were without mercy butchered by the Irish, who pleaded that they thus revenged the like cruelty exercised by Bingham on reducing this fort." This is an intentional falsehood, for both the Four Masters and O'Sullivan state that the garrison had surrendered on honourable conditions, and were spared by the Irish! Again, O'Donnell was not then at all at Enniskillen, all which Leland knew very well. Compare O'Callaghan's edition of Macaria Excidium, p. 312. The late Michael Maguire, of Trim, who was living in 1837, aged 90, traced his pedigree to this Cuconnaught More.